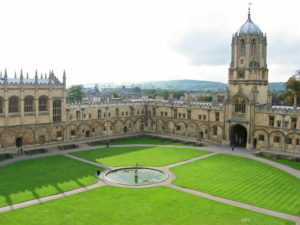 Christ Church is one of Oxford’s oldest, largest and best-known colleges. Affectionately called “The House” (Old English for Church), it was originally founded as Cardinal’s College by King Henry VIII’s chief minister, Cardinal Wolsey, in 1535. King Henry later re-founded the College under its present name in 1546. Tom Tower, a feature of the Oxford Skyline —the “Dreaming Spires”— was built by Sir Christopher Wren, an alumnus. Other famous alumni include 13 Prime Ministers (more by far than any other college in Oxford or Cambridge). Some recent Premiers from the House include William Gladstone, the Marquess of Salisbury, Anthony Eden and Sir Alec Douglas-Home. Other Old Members include 11 Viceroys of India, John Locke, Albert Einstein and the author of Alice in Wonderland, Lewis Carroll (Charles Dodgson). The College has about 400 undergraduates and about 175 graduate students. There are twelve Professors (Chairs) amongst the faculty. Oxford University has one Chair in each subject. The College chapel is unique in the world; it is also the Cathedral of Oxford. The 18th Century library is one of the largest in Oxford. There is also a Picture Gallery, and Art Room, a Music Room and a Computer Room. The dining hall is among the most beautiful in Oxford. The College has recently ranked in the top 20% of all the primarily undergraduate colleges in the Oxford Academic League Tables. The College selects a few Associate Members each term from a list of highly qualified students recommended by OSAP. While in Christ Church these students are under the care of the Senior Censor, a Fellow (in the House, Fellows are officially called “Students”), and the Tutor for Associate Members. For more information on Christ Church, visit www.chch.ox.ac.uk.